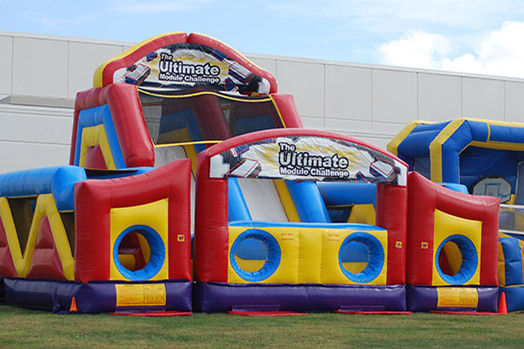 Keep your child entertained while they’re out of school with summer daycare. Find the right summer or holiday program for your child. 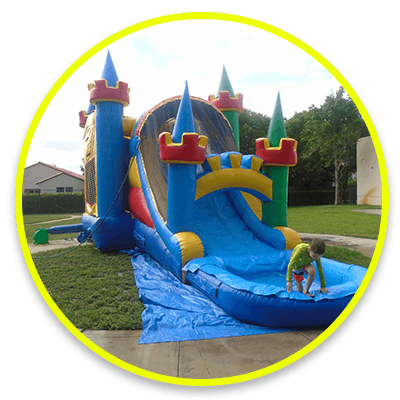 At Kidstown Learning Center in Lake Worth, we offer a wide range of programs to provide your child with structured summer and holiday learning environments. Our dedicated staff works hard to create fun activites that keep your child engaged and active while also adhering to a daily routine. While your child is having fun, we will also provide them with developmental opportunities that include developing coordination, building their self-condifence, and fostering indvidiual independence. Contact us to learn more about our specific summer and holiday offerings and get your child’s summer planned. • Fun activities that keep your child entertained and make those summer days fly by. • Helping your kids find friendships that can last a lifetime. • Fostering new skills including coordination, self-confidence, and space where they can discover themselves. • Providing breakfast, lunch, and dinner during all summer and holiday programs. Kidstown Learning Center is your child’s place to learn and grow no matter what time of year it is! From holidays to summer camp, we are always here to provide your child with more than just a place to be. No matter if your child attends our summer daycare for a couple of weeks or a couple of months, you can rest assured that they will be well taken care of! Kidstown Learning Center also provides breakfast, lunch, and a snack each day during our summer and/or holiday camp. Contact Kidstown Learning Center today to learn more about our Lake Worth summer daycare. We are now accepting enrollment for the 2019 summer season. Book your child’s spot today! For working parents, the benefits of summer daycare might be obvious. However, Kidstown Learning Center is more than just a place for your child to be — it’s a place for them to learn and grow! We are happy to provide the attention, supervision, and care that your child needs and deserves for those times when you have prior obligations. But beyond that, our summer camp program also offers developmental benefits for your child. Not to mention, children crave and benefit from having structure in their lives; getting them into the routine of heading to summer camp every day will provide them with something to look forward to each day and foster a sense of excitement. There’s always something going on here at Kidstown Learning Center. The fun doesn’t stop during our kids’ summer camp, which has activities and action galore. Your child will be entertained with games, inflatable jumpers, field trips, water play, arts and crafts, movies, and a whole lot more. Summer day camp provides a perfect opportunity for your child to forge new friendships. 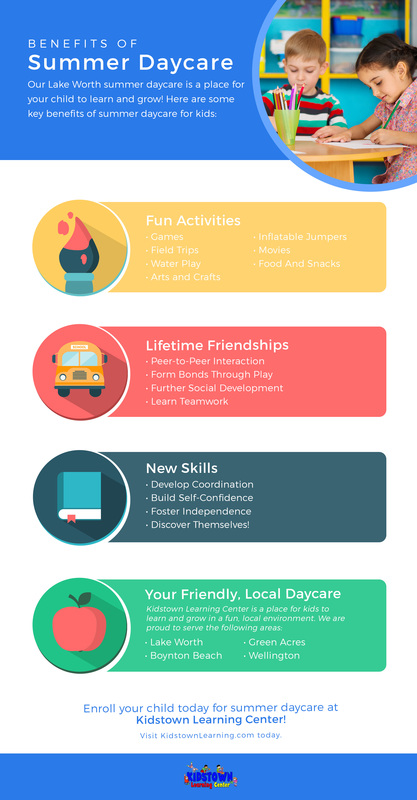 It’s commonly known that children grow through peer-to-peer interaction, and summer daycare is the ideal place for your child to experience the wonderment of being a child along with their peers. Your child will form bonds through play, learn valuable traits like teamwork and sharing, and further their social development. Summer offers a much-needed break from the regular school structure and lessons — but that doesn’t mean they really stop learning. At our summer daycare, we encourage the growth and development of our students through a number of activities. Here is where they will develop skills like coordination, build self-confidence, foster a sense of independence, and truly discover themselves! Contact Kidstown to enroll your child at our Lake Worth summer daycare today. We can’t wait for a fun-filled summer!